It's been awhile since I last updated a travel post, and my last year's trip to Avani Sepang Goldcoast Resort wasn't as impressive as I'd thought it will be. Read on more...so that you'll know what exactly to expect if you are going to choose Avani as your stay. Don't get me wrong though, the view and the shower (yes...the shower) is amazing. Indeed it was very therapeutic. But what bothered me just a little bit was the fact that the walls had many spots of paint peeling off and curtains weren't changed to newer ones; as there was visible cigarette burnt marks. Now, normally these little defects won't affect me or my experience of staying at a place, but I just thought of pointing it out as I do realize that there are travellers which are more 'particular' when it comes down to even the smallest details. When I walked into my room, I was greeted by a beautiful swan couple. A little bit awkward since I was alone, but hey, at least you'd know how it would roughly look like when you come in for a honeymoon stay. Or maybe they will do a little more in terms of decoration, I don't know, it's best for you to call them personally and check what do they offer for Honeymoon deals. The bathroom was what turned my perspective around; although I am usually not picky, I hate to admit that I get very agitated if the toilet isn't well taken care of (my experience in Thailand, was horrible as the hotel my parents and I stayed at had horrible bathrooms! Can you imagine, you had to squat in the tub to take a proper shower, and if you were big in size you'd probably had to squeeze yourself into the tub. My father even hit his head multiple times with the shower head. The flush weren't properly working and neither were the sink taps --- the horror that I wish will never befall any of my readers). Thankfully, Avani's bathrooms were well-maintained. Even the shower felt like I was playing in a rainfall. The highlight of my stay at Avani was the sea view that my room came with. Be it, sunrise, sunset or even the night view, I was always accompanied by beautiful sceneries, the calming sounds of the waves hitting the beach and the occasional birds flying by. It was so therapeutic that I could definitely stay in my room while enjoying the breeze at the balcony for 3 days straight with just a novel and some yummy food. Speaking of food, Avani's breakfast buffet is delicious. Simple meals were prepared but definitely full of flavour. There were the classic Malaysian breakfast meals and really good taste-bud-tingling pastries. It's been awhile, but I remember filling up my plate with all their pastries; F.Y.I I don't enjoy sweet food as much; but I went all out because they were good. During my 1 day stay, I didn't manage to dip myself in the pool, as there were too many people in the pool by sunset. Some, were swimming but I noticed that most of them were staring at the beautiful sunset. I did the same too, the only difference was that I was out of the water. Oh! Before I forget, if you do choose to stay at Avani please don't forget to visit HM Sri Bagan Sepang! 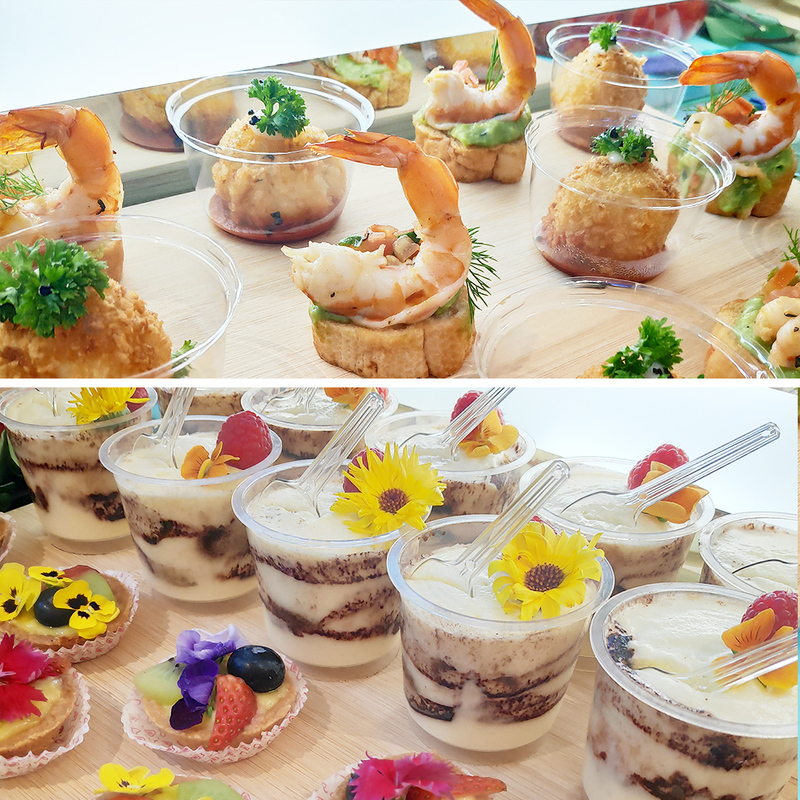 You will enjoy the whole trip even more with all the mouthwatering seafood delicacies that they serve. It was my third time dining in at HM Sri Bagan Sepang, as I've been there twice with my former colleagues from Limkokwing. Let me make a public service announcement, because if you are planning to stop by the beach near the seafood restaurant you'll need this fair warning. There are way too many beach bugs at there and ever since they started digging up the place to add more land, the bugs and every other insect had multiplied in number. I only went to the beach to take, more or less, 10 shots of the sunset, and I came back to my room (after dinner) with more than a dozen insect bites all over my legs. So its best to wear fully covered clothing if you were to go there or better yet, just skip the beach part. Even though it was a really brief stay, I still managed to calm my mind and block out all the stress. If you are looking for a short getaway from the city, then you could also book a room for yourself at Avani Sepang Goldcoast Resort. I do sincerely hope that you will enjoy your stay at Avani and that their management will pay a little more attention to details especially the up-keeping of their rooms. Till, my next travel post, have a good trip to all my fellow travellers! 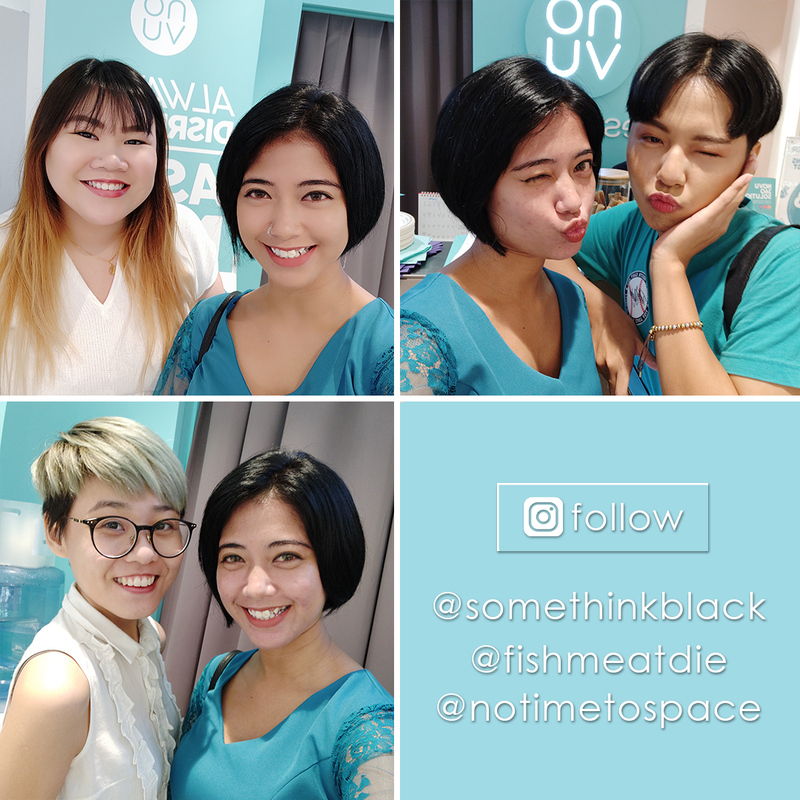 On 30th March, I had the opportunity to join the Butterfly team for a little tea party while enjoying and receiving NOVU aesthetics treatments. 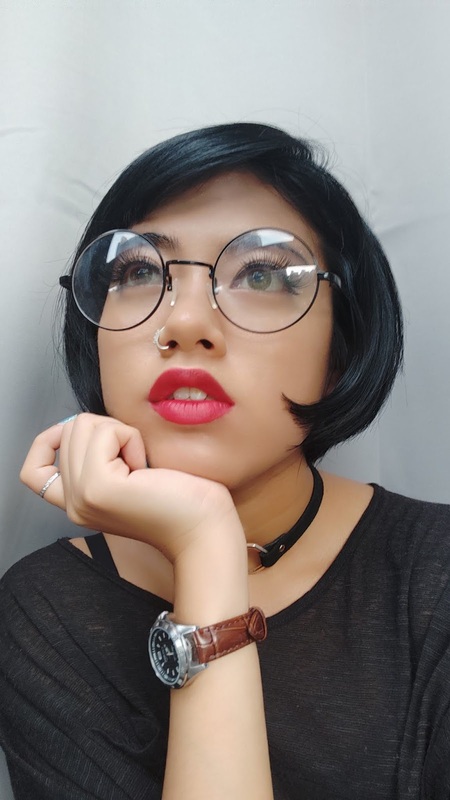 Honestly, I was rather nervous because it has been months since the last I met the other Butterflies and of course, this was my first time getting a series of aesthetic treatments (after an extremely horrible experience of getting a facial treatment years back; which took me 6 months to recover). Being a member of The Butterfly Project for more than 4 years now, it gave me the boost of confidence to actually give NOVU Aesthetics a try. Dare I say that I became a little more brave since there were other Butterflies around, some who were also trying out facial treatments for the first time. 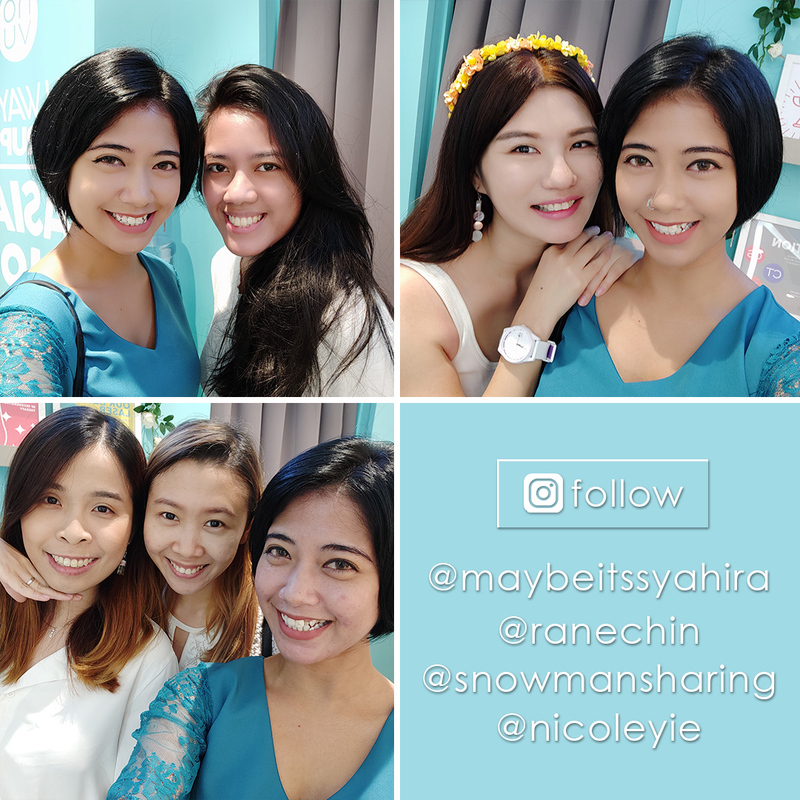 If you'd like to virtually meet some of the Butterflies that attended this exclusive tea party with NOVU, don't worry, I've prepared their Instagram handles with our selfie moments. P.S: Their handles are mentioned from left-to-right . Of course, what's a tea party without a little refreshments, right? The super friendly and accommodating NOVU team prepared these cute little pastries, yummy finger foods and a very refreshing drink. As each Butterfly took their turn to try out the treatments, some were busy chit chatting away while a few more were constantly snapping pictures and even 'interviewing' each other after they were done with their session. 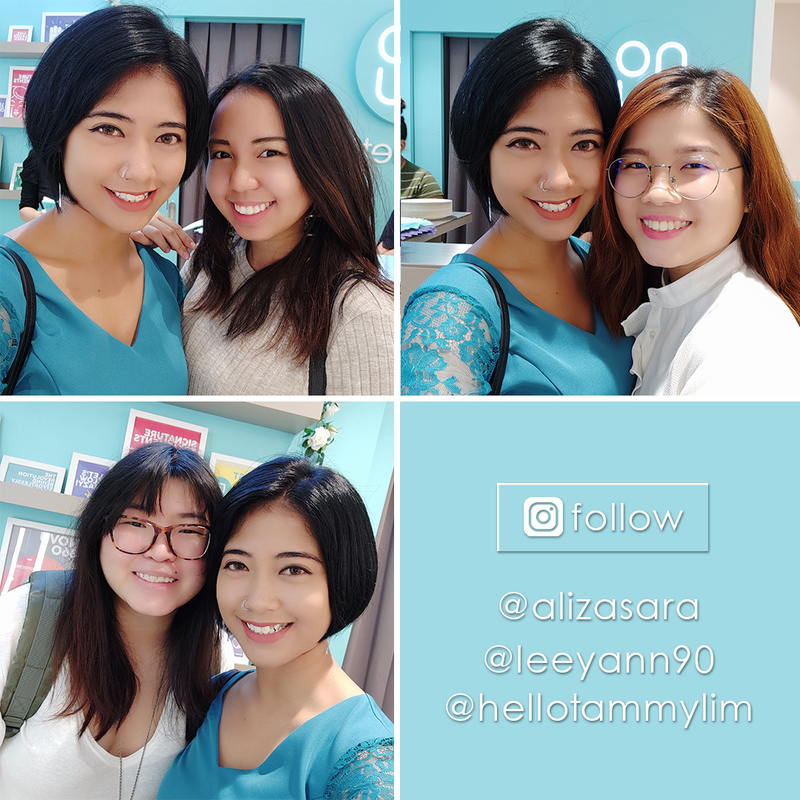 We were truly blessed as we got to try 3 of their treatments on that day itself; whereby 1 of it was their newest treatment which is the Eye Revital Treatment. In my case, I got to try another one of their treatment which was the Ion Infusion when I visited them for the second time. On top of that, us Butterflies, were also gifted with 1 Enliven Eye Gel which was worth RM193 and yes it is the same cream that is used in the Eye Revital Treatment. Based on the 3 main skin conditions; Colour (uneven skin tone and pigmentation), Consistency (skin roughness, enlarged pores and blemishes) and Contour (loss of skin firmness and wrinkles), the NOVU 360 Solution was invented. 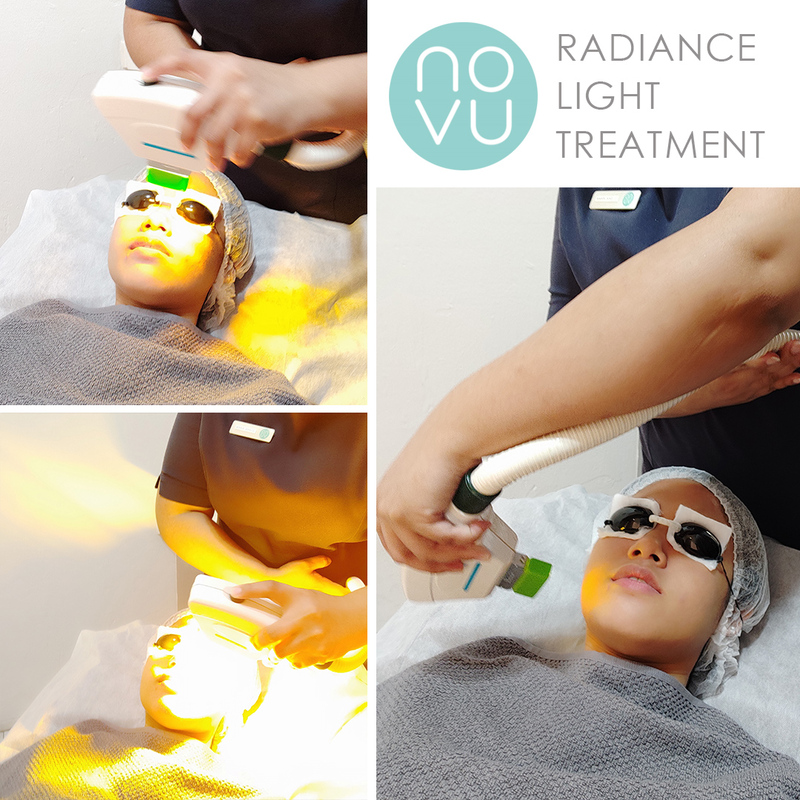 Once you go through a comfortable 1-to-1 session with the NOVU experts, you will be advised to a combination of different treatments to help eradicate your skin problems. 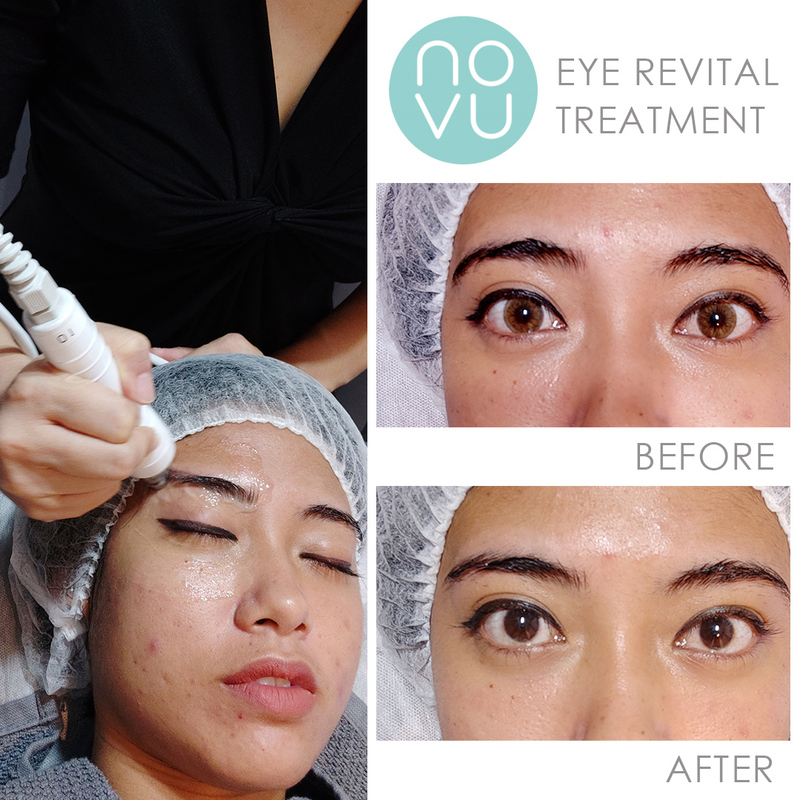 This is a brand new treatment that was recently launched by NOVU. This treatment that focuses on the usage of energy contouring technology, stimulates collagen and lifts the skin around the eye area. If you have fine lines or wrinkles around your eyes, saggy eyelids or even dark circles under your eyes, then this treatment will do great for you. For me, the results were instant! Some of the wrinkled lines near my tear duct had reduced by at least half of what it was before, my eyebrows and the outer corner of my eyes were also lifted. 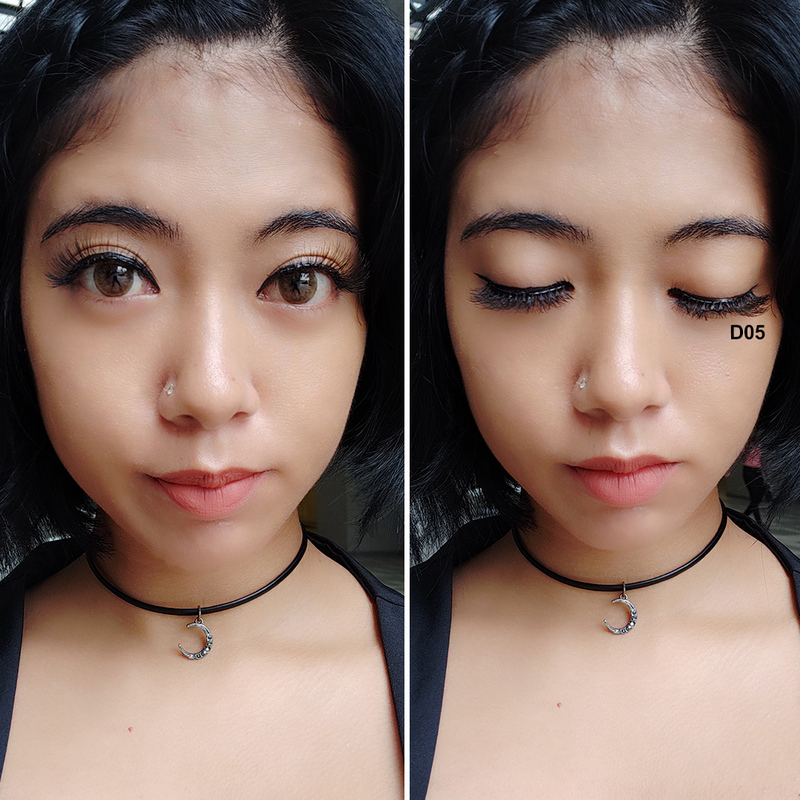 This was quite easy to notice especially since my left eyebrow is usually flat (straight line), however, after the Eye Revital Treatment my left eyebrow became more arched. This is a non-ablative laser treatment; which also means that it is a far less invasive treatment that works by heating up targeted tissue without actually destroying it. This treatment helps to stimulate your own collagen production to fill up unwanted skin imperfections. So not only this treatment will promote skin rejuvenation it will also reduce pigmentation and acne making your skin looking more brighter and clearer. Don't worry, although laser treatments may sound scary and the little prickly heat from the laser may make you shiver in fear, this treatment is gentle enough to treat a wide variety of skin types. Plus! 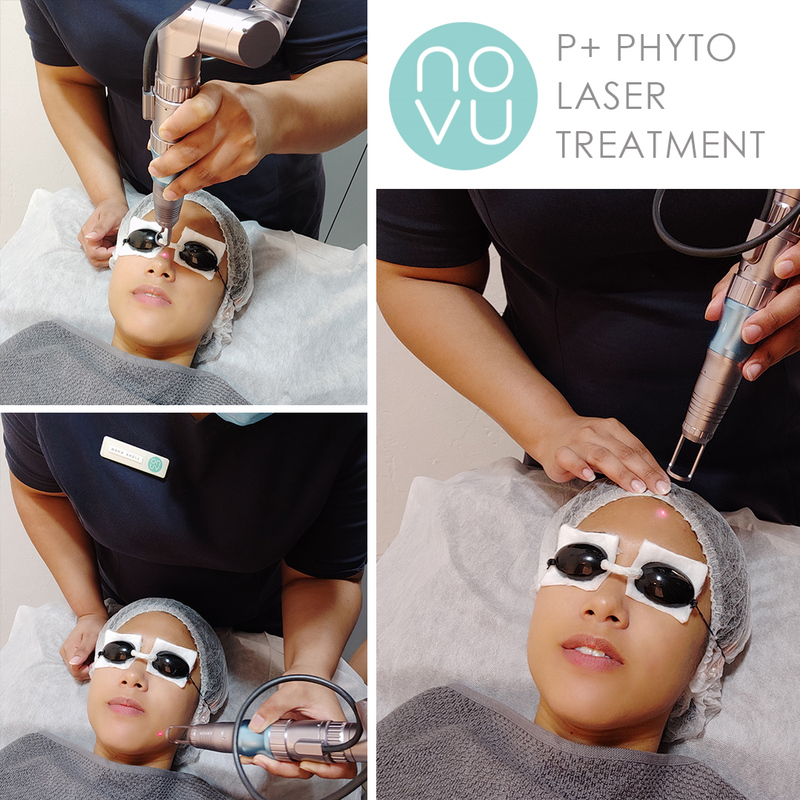 The NOVU experts will always ensure that you are comfortable throughout the whole procedure; even from before you start the treatments right up to after you are done. Now this is a treatment that will let you feel like a superstar being haunted by scary and obnoxious paparazzis, as the bright flashes will help to stimulate collagen production, kills surface bacteria while preventing acne and pimple formation. And yes, this treatment also helps to lighten, brighten and even out your skin tone. I kid you not, I was constantly squeezing both my eyelids together just to make sure I could enter a dark abyss as the 'flashes' were shining light upon my whole life. So, do make sure that you'd close your eyes shut too when you are receiving this treatment. 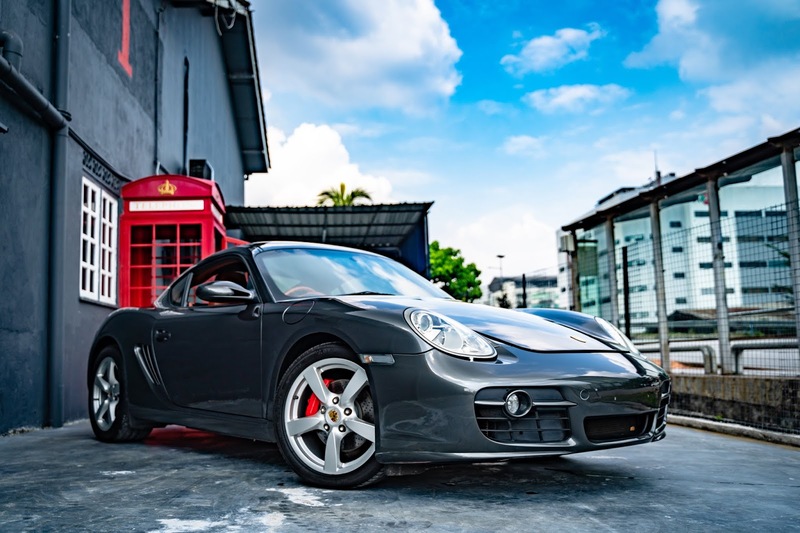 Note: The P+ Phyto Laser and Radiance Light Treatment is a duo treatment session which costs RM168. This treatment I got to try during my second visit, and I can vouch that this is the most calming and cooling treatment in their book. Not only did it improve my skin's hydration but it also instantly calmed my skin making it smooth, supple and much more radiant. 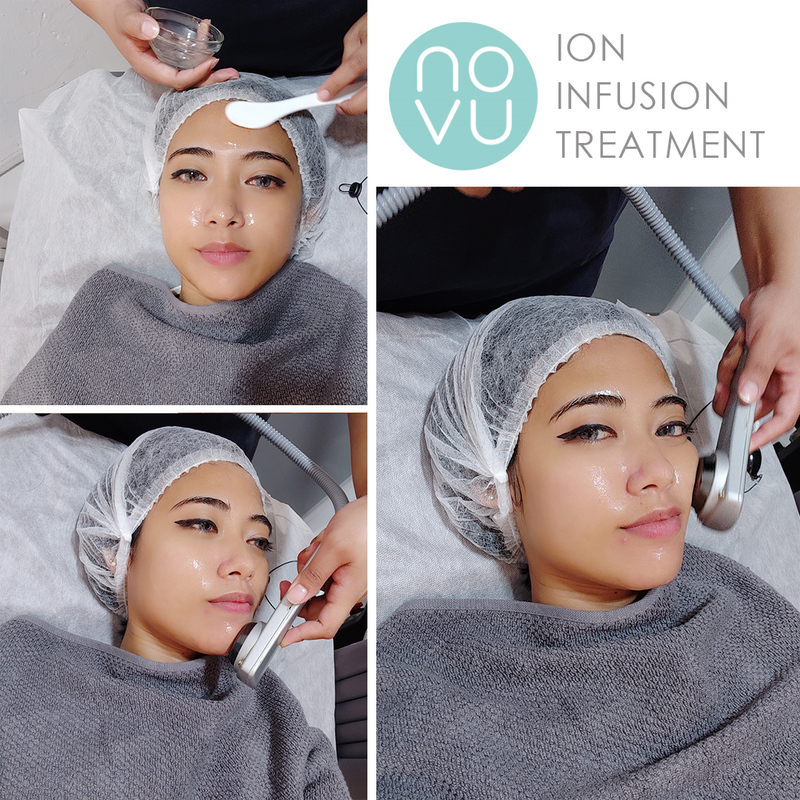 For this treatment, they use their very own NOVU's Iontophorosis to infuse moisture and nutrients deep into the skin. If this treatment could last for a much longer period it would also be the perfect face massage there is in town! Oh! Wait, I think I did not mention earlier that most of these treatments don't take long and even with a combination of treatments you'd most likely to be done within 15 minutes. It's almost like Aesthetic Treatments On-The-Go. This is the only treatment that I have yet to try; but we were given a little bit of guidance of how this treatment works. Basically, the RF-Fibrotaut uses Radio Frequency technology to promote collagen production to lift and tighten the skin while plumping it from within. This treatment also helps to expel toxins and improve skin micro-circulation at the same time. I would probably try this on my next visit to NOVU; but my main focus is to make sure that my skin receives the hydration that it needs because I do have dry skin issues, and the current state of our weather isn't helping to ease my condition either. 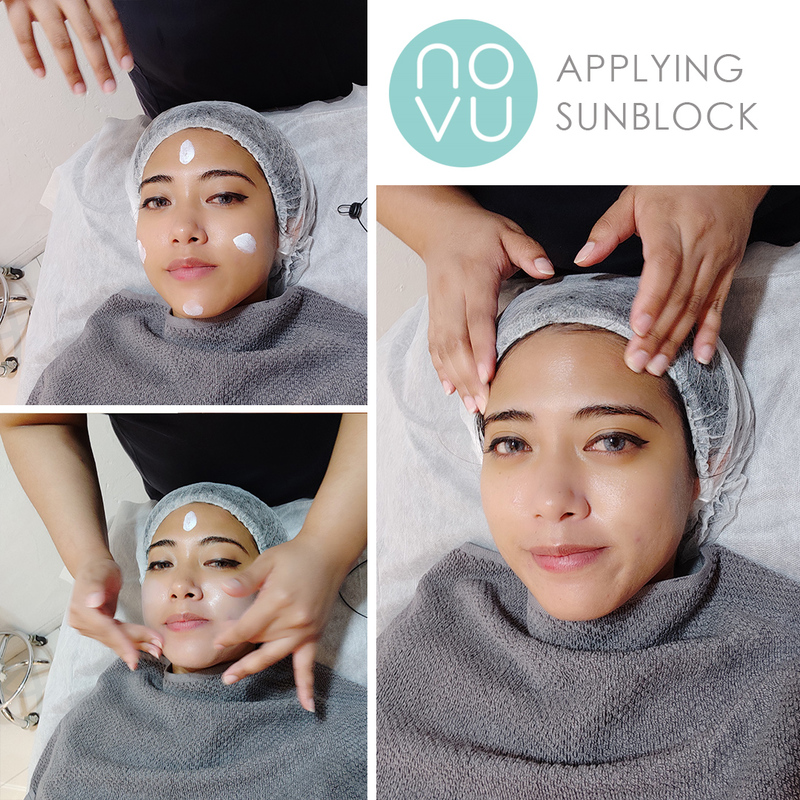 After each session, they would also apply calming cream just in case for those who have slight redness after-effects but more importantly they seal all the benefits of their treatments and protect your skin from the environment by putting on a generous amount of sunblock from one of the NOVU series. According to Lisha (the second NOVU expert that attended to me), she normally uses this sunblock as her base for makeup as she doesn't even put on foundation and what not. So, I'd safely guess that you could do the same too. 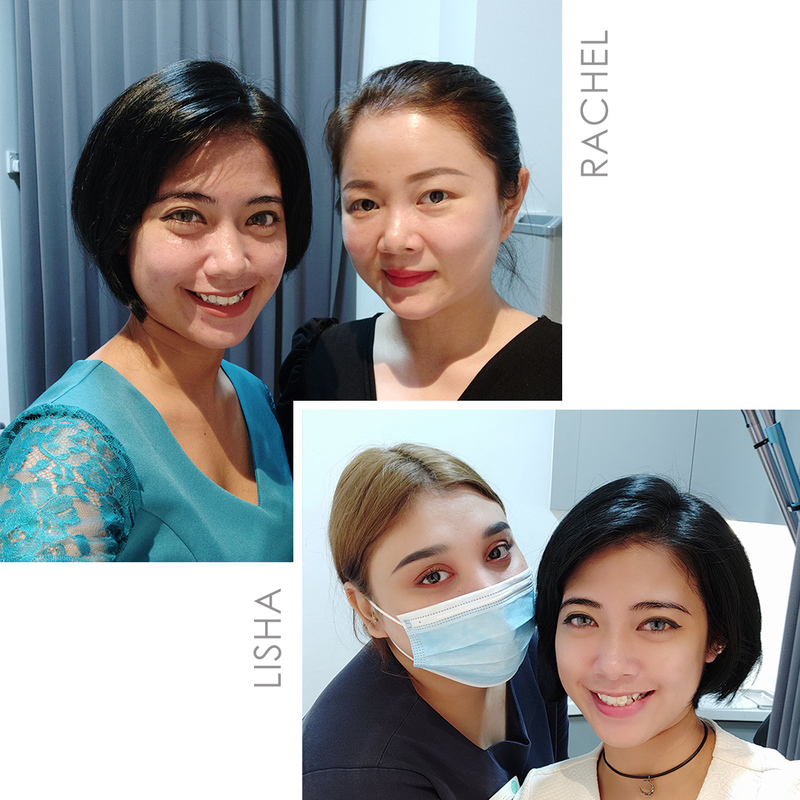 I had the absolute privilege of being taken care of with much care and attentiveness by both NOVU experts, Rachel and Lisha. Both of them made sure that I was always at ease whenever they were doing any of the procedures; be it before, during and even after. 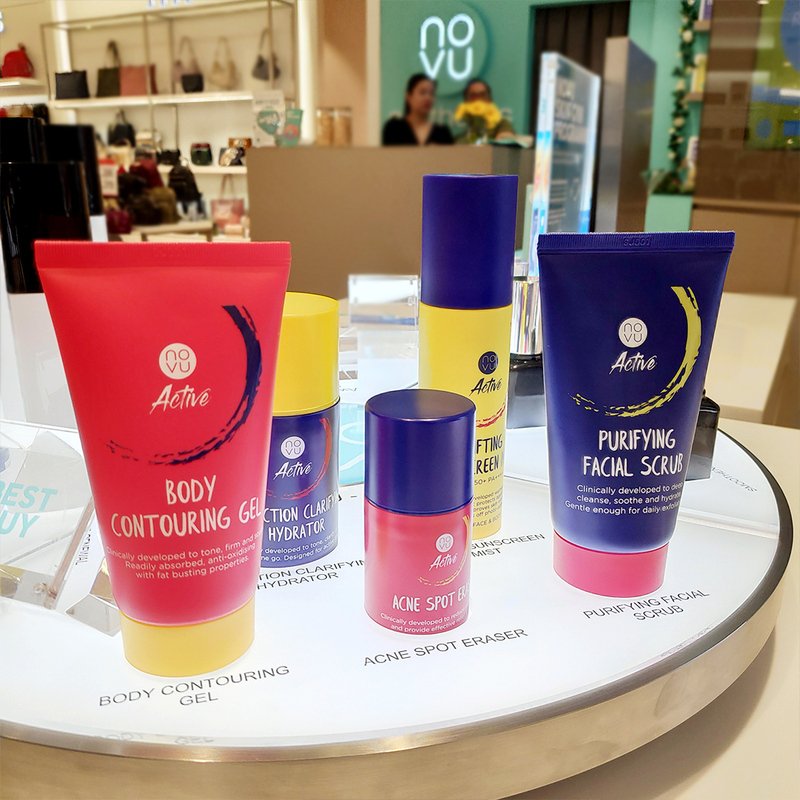 I became really enthusiastic after my first visit, so much so that I actually bought a set of skin care from NOVU under their Active series. Besides the Body Contouring Gel, I went ahead purchased the rest of the four products. It was also highly recommended by Rachel for my dry skin type. And I have never regretted my investment in it as my skin has remarkably changed over the course of lesser than a month! No joke, I just added these products into my skin care regime and my skin stopped being oily, it is almost never dried out and my skin looks and feels much healthier now. I am already excited for my next visit - definitely looking forward the next Ion Infusion Treatment. What about you? Hi there everyone! Remember the last time I introduced two products that could help you win against the extreme heat we are suffering from? Well, I have even greater news to unfold as I have two more products that can help you calm your skin and boost moisture while you are it! It's no other than the much loved and praised Althea's Waterful Green Bamboo pads that helps to quickly boost the level of moisture in your skin and the Althea Skin Relief Calming Cream which moisturises while soothing your skin. You can use this bamboo pads as a toner and/or a facial mask. I personally prefer to use this as a mask, although as of 3 days ago, I have been using it as a toner, since I do not own a toner in the first place. To use it as a toner, all you'd have to do is to pull out a pad with the plastic mini tong that is provided, and gently wipe the pad on your face; starting from the middle and working your way outwards. I realised that this bamboo pad helps to smooth my skin texture allowing it to become a flawless base for my makeup. Of course, it also keeps my skin well hydrated throughout the day. My face has been producing much lesser oil in comparison to before. Which is a great sign; that shows my skin is sufficiently hydrated. To use it as a mask ,like how I'd prefer to, I will use 3 pads (like the above image) targeting all my dry areas. I will usually leave on the bamboo pads on my skin for 10 minutes, right after I get back from work, when it's midday and the heat is just atrocious. And despite the heat, my skin will always feels much supple and moisturised, right after. You know how Korean artists usually have that dewy skin? Yeap! That's exactly how my skin feels and looks like after the short moisture-reboost-session. 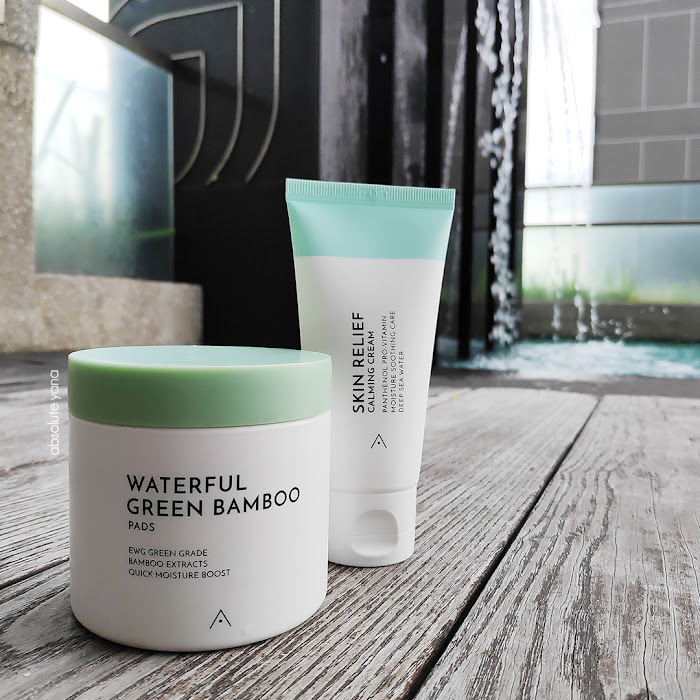 If you'd interested to know, this Althea Waterful Green Bamboo contains Bambusa Vulgaris extract as its key ingredient along with Salix Nigra (Willow) Bark extract and Centella Asiatica extract. The bamboo extract helps with the deep hydration. The Willow bark extract has anti-inflammatory and antibacterial properties that helps to gently treat your mild-troubled skin. The Centella Asiatica extract helps to treat and repair damaged skin while soothing it. Do not worry, all the ingredients used to make this product are EWG grade; meaning that they are safe ingredients tested and chosen by American environment NGO. One tub of the Waterful Green Bamboo comes with 80 sheets of pad and it costs RM54.00. I would say that it is a good deal as each pad relatively only costs about 70 cents. 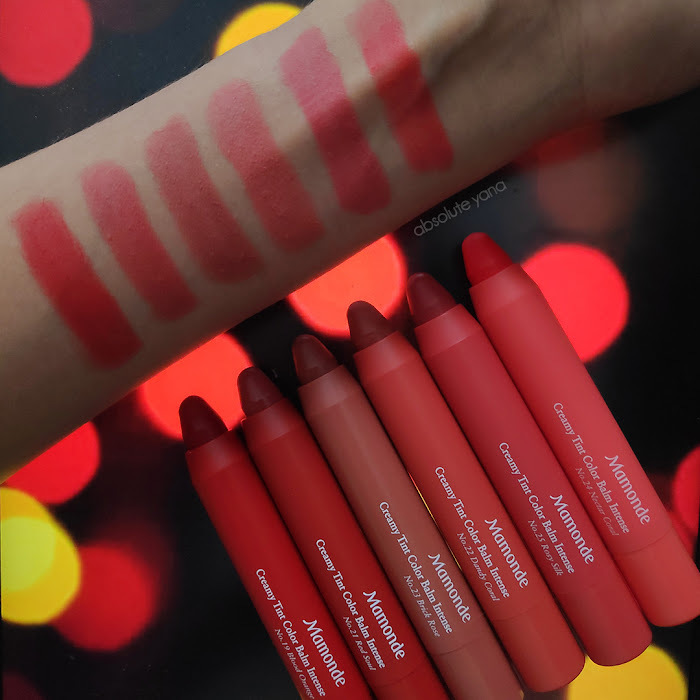 Will I be re-purchasing this product? Of course, I will. My skin has already improved so much thanks to this product addition into my skin regime. Even my partner agrees with me. Now, for this product, it actually took me by surprise mainly because of the cooling minty effect that it left on my skin. 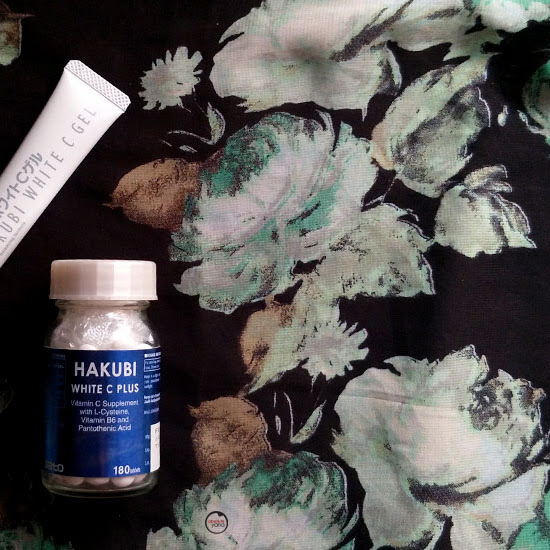 So, this calming cream is meant to be used right after your toning. It has a watery-cream like texture (or I would say a lotion-like texture) that absorbs really quickly into the skin. Not only does it help to moisturise my skin but it also helps to repair damages and irritations caused by the high-polluted air around us. I would say that this cream really helps to lock down the moisture beneath while creating a barrier-like protection from all the harmful particles. This cream is a little more complex in terms of its composition as it has more than 5 key ingredients; which is the Eclipta Prostrata Leaf Extract, Amaranthus Caudatus Seed Extract, Barbadensis Leaf Extract, Ulmus Davidiana Root Extract, Ficus Carica Fruit Extract, shea butter, hydrogenated lecithin, chamomile water, seawater, and Panthenol. Panthenol is a special substance that transform into Vitamin B when absorbed into our skin, keeping it hydrated and soothed, while it strengthens our skin barrier function. Seawater has anti-aging properties that helps our skin to have the radiant glow. Shea butter and the hydrogenated lecithin is known to have rich hydrating properties that nourishes the skin and forms a protective moisture barrier. The Chamomile water helps to soothe and improve moisture retention in the skin. The extracts that were mentioned above is the key factor in strengthening our skin, overall. I would highly recommended this product for those who are dealing with troubled skin. For me, personally, on the days, when I am having to deal with the rise of pimples, I would add to this skin relief calming cream in my skincare regime. This Althea Skin Relief Calming Cream comes in a 80ml tube and it costs RM44.00. Since, I am only using this product when there are signs of pimples about to pop up, I can definitely say it is worth the purchase as it would probably take a much longer time for me to finish this product. Will I repurchase this? Probably, especially when I need it to calm the irritations on my skin. If I do stumble upon more products that can help to re-hydrate and beat the heat, I will share them in future posts as well, so do make sure to subscribe to my newsletters to stay in the loop. Alrighty then, till next post, make sure to keep yourself hydrated from inside out! 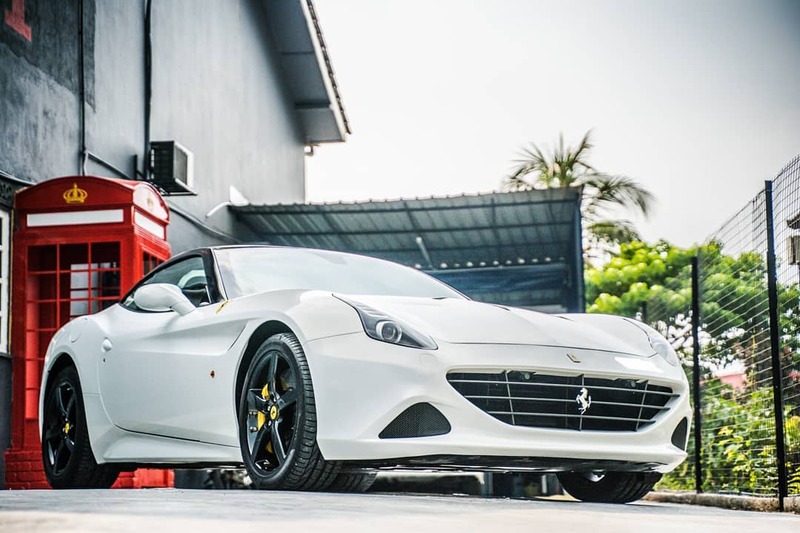 If your life revolves around luxurious cars, be it a mere interest or passion, then you should be following One Corsa, the exotic car trading garage. One Corsa has recently made its presence known to a wider audience when they hosted a photoshoot session for Hypertune Malaysia. During the photoshoot, the gorgeous Jennifer Nee posed along side the Mazda RX7 and Toyota Altezza, showcasing all the right curves of both the metal and human flesh body. You'd probably by now, eager to find out what are the cars that can be found in One Corsa's garage, well, allow me to help you with that information. 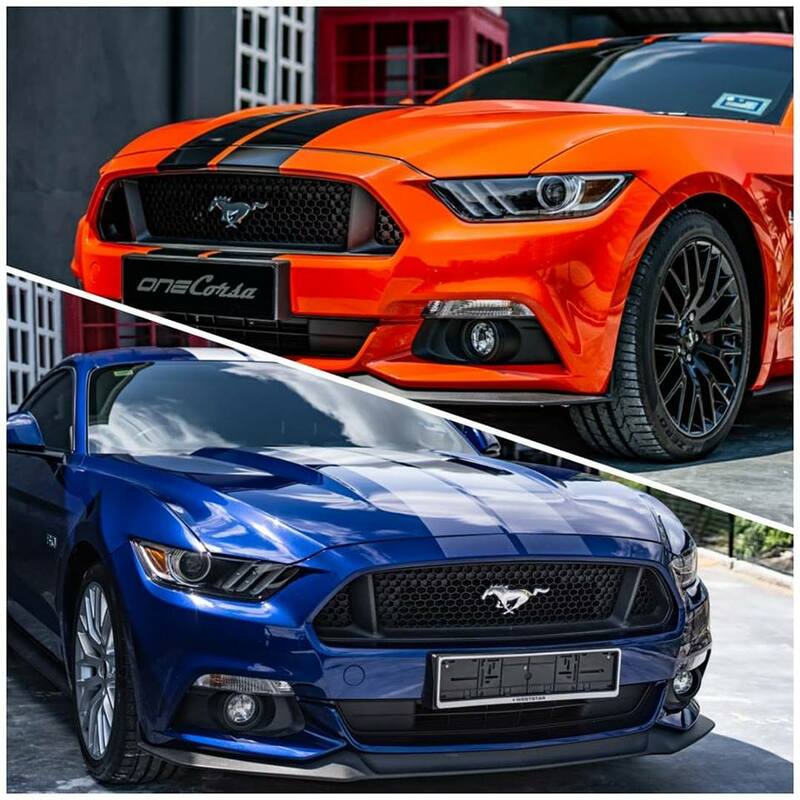 One Corsa has the all-time-iconic Mustang G.T, with two colour variants, Orange Black Stripes and the Kona Blue; the most usable Ferrari ever made the California T; the committed to beauty and power of 2009 Aston Martin Rapide; a Porsche Cayman 2007 that's equipped with Bose Surround System and many more. Meanwhile, I am going to share a few pictures of some of the beasts that I've mentioned above. If this mini show-and-tell session has piqued your interest, then I'd highly suggest that you book an appointment for private viewing with One Corsa. You can contact them through One Corsa Facebook or One Corsa Instagram. 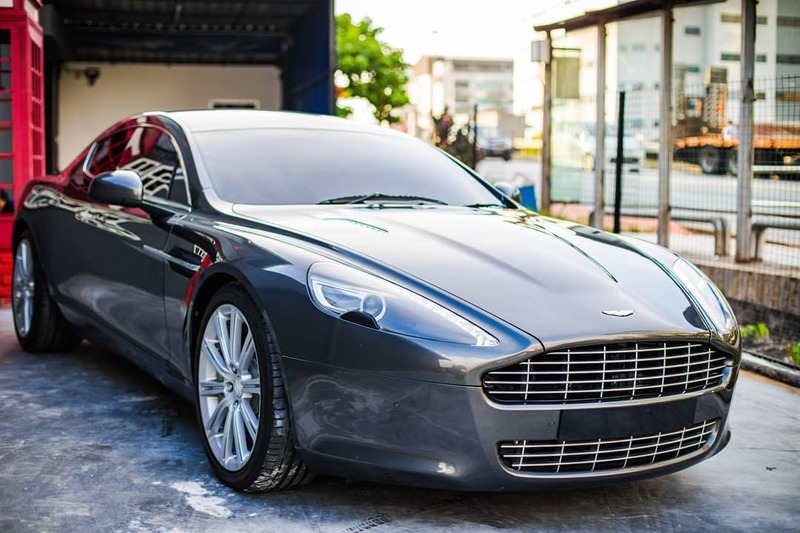 Also, just so you know, One Corsa isn't just an exclusive garage to purchase your new ride, it is also a safe place to trade your luxury car, as you and your beloved ride will be handled by a dedicated and passionate team; where their prides lay within the automobiles that comes into their garage. You can definitely put your mind and heart at ease when dealing with the One Corsa family. Till you find the ride of your life, take care and ride with pride. If you are looking for simple middle eastern food, then do stop by Hadramawt PJ in Paradigm Mall. I simply love having their beef combo kebab! If I'm not mistaken even on the 5th time, my partner and I had our dinner there, I couldn't stop myself from ordering the same thing over and over again. The only difference in my order would either be a kebab beef combo or just a normal kebab beef. I am actually not 100% sure on what is the dish's real name, but rest assured that it is yummy. Everything about it is really good, even the garlic sauce is heavenly! I'd usually take two sauce bowls full of it. A habit that I picked up from my other half. Last time, when I stayed at Cyberjaya, during my uni days, there was a small stall that sold Arabian Kebabs and it was the bomb. Sometimes, my friends and I would order two each just because it was really yummy too, and it was easy to fill the tummy while being extremely affordable. I really missed those days, and after Paradigm Mall upgraded their Lower Ground Floor into a food heaven, I don't have to miss it anymore since I can always stop by Hadramawt anytime I want. As for the pricing, you can expect it to be a little more pricey than your regular local dishes. Their pricing begins from RM10-RM30. My favourite beef kebab is priced below RM20 however, when I feel a bit luxurious, I would go for their combo, and that will cost me around RM25. I have yet to try out the rest of the dishes on their menu, hopefully, the next round my brains and taste buds would want others. If there's more of what I love from Hadramawt, I will surely update this post again. Till the next update, please do go try out Hydramawt and let me know what do you think of their meals! Worth the try or nah you'll just order a pizza instead. Beginning of April has been such a blessing, since I have gotten more time on my hands to paint. This Black Gold series occurred to me rather randomly. Despite, loving all things black, it did not come to my mind to actually paint or create art pieces which were heavily influenced by the colour, black; till now, that is. Never have I ever fallen in love with black even more than now. 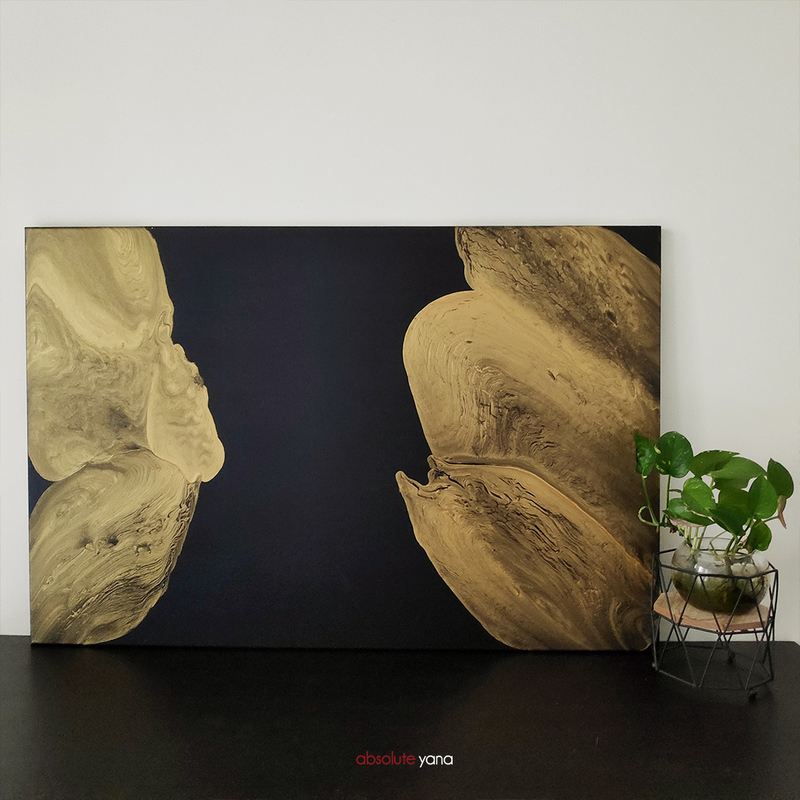 If you love black or simply looking for an art piece that looks simple, elegant yet majestic, then do take a good look at these paintings. And just for the month of April, I will be having a special promotion where most of my paintings will be discounted. Some even up to 50%. So, do not miss out on this opportunity. Currently, I have the "7 Golden Rings" and "The Broken Art". Playing with the acrylic ring pouring technique, I've created this piece with 7 pours; hence it's name. 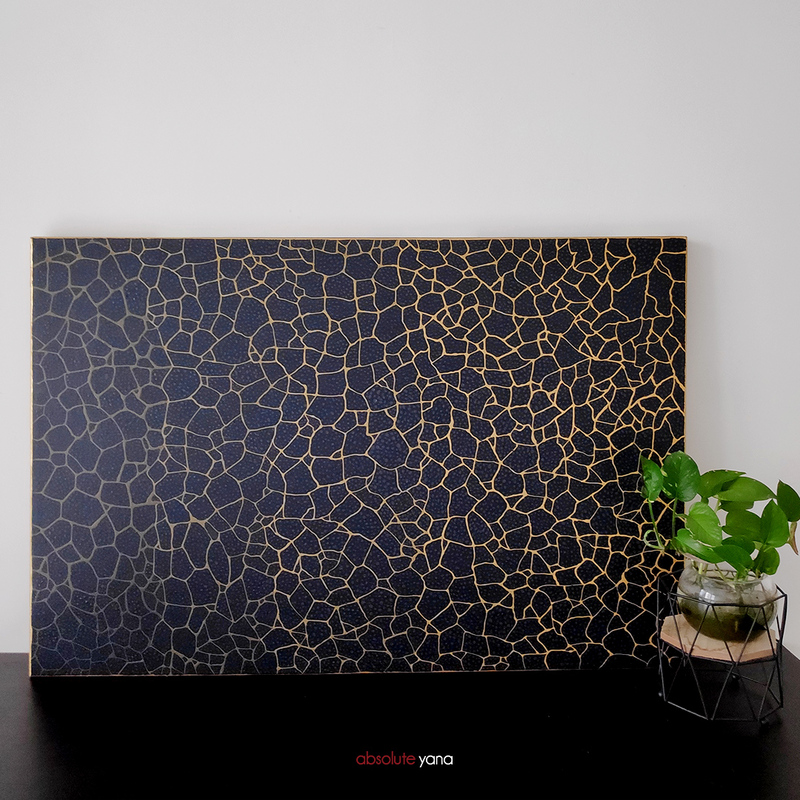 The beauty of this piece, lays within the cracks of gold; depicting the years of a tree's growth. This piece also have much texture to be felt and stared upon. The broken art is heavily inspired by the art of Kintsugi ( Golden Joinery) or Kintsukuroi ( Golden Repair). Also picking up on the basic texture of pottery, I've spent 7 hours collectively carefully dotting its texture. This piece of art, to me, is unique, as you can only appreciate the beauty of it when you are up close. It reminded me of how many people these days don't see the beauty of people or things around them, but are more than quick to judge something from afar. Wrapping my thoughts on this sort of art and this bond of intimacy, I took my time to recreate that into "The Broken Art". There will be more Black Gold series that will be coming up in this month. Please do keep an eye out for it. Till the next art piece is awaken, have an excellent month ahead. To purchase any of my artwork, please do email me at absoluteyana@gmail.com. Who else is getting tired with this heat wave? Well, if you are not, I definitely am! That's why I have been beating the heat with two of my newly found saviour, Freeman Water Gel Mask and Freeman Cooling Gel Mask. No joke, ladies and gents, this heat has gotten my skin way much more drier than before. Like without any exaggeration, the moment I get into my car, I can feel the moisture in my skin (face) evaporating away as my skin gets much tighter after just 2 minutes sitting inside the car. So, for the past two weeks I have been rushing back home just so that I can enjoy a cold shower and relaxing away after applying a refrigerated gel mask on my face and neck. 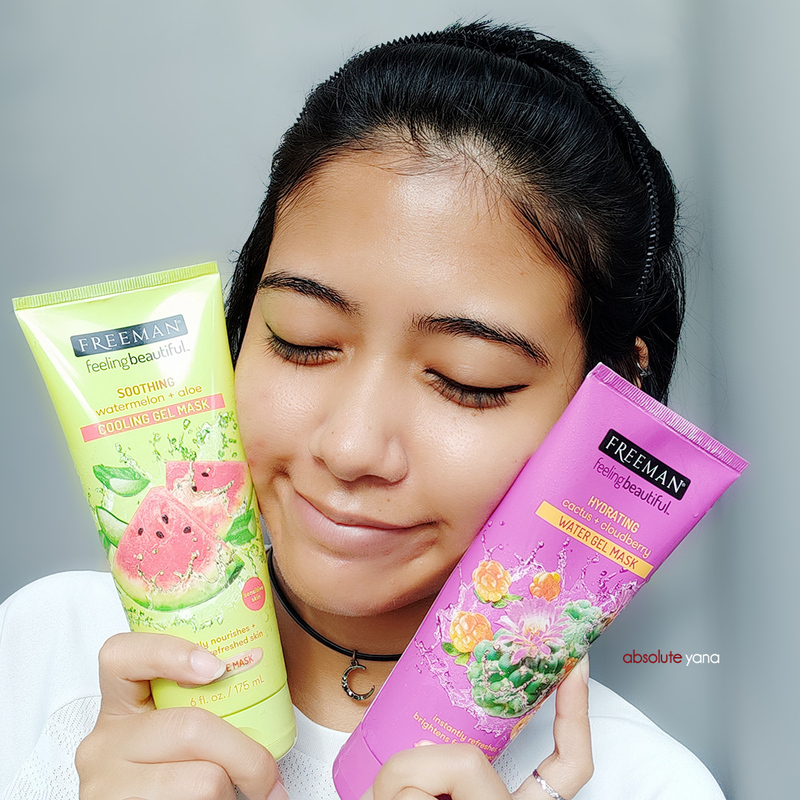 No specific reason as to why I chose to use this Freeman Gel Mask range, is just that it was a new range of products that were available at the Watsons outlet that I always visit. And since the price is quite affordable, why not just give it a try, right? Freeman also have their Clay Mask, Peel-Off Pomegranate Mask, Hydrating Gel Cream Mask and a few more other types of mask. 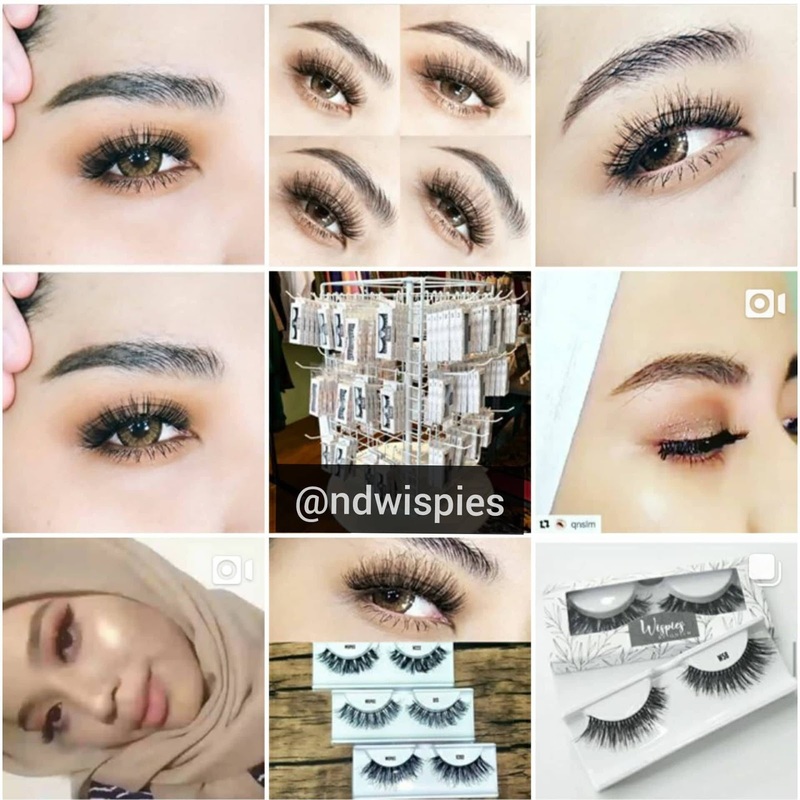 Their prices ranges from RM20 right up to RM27. 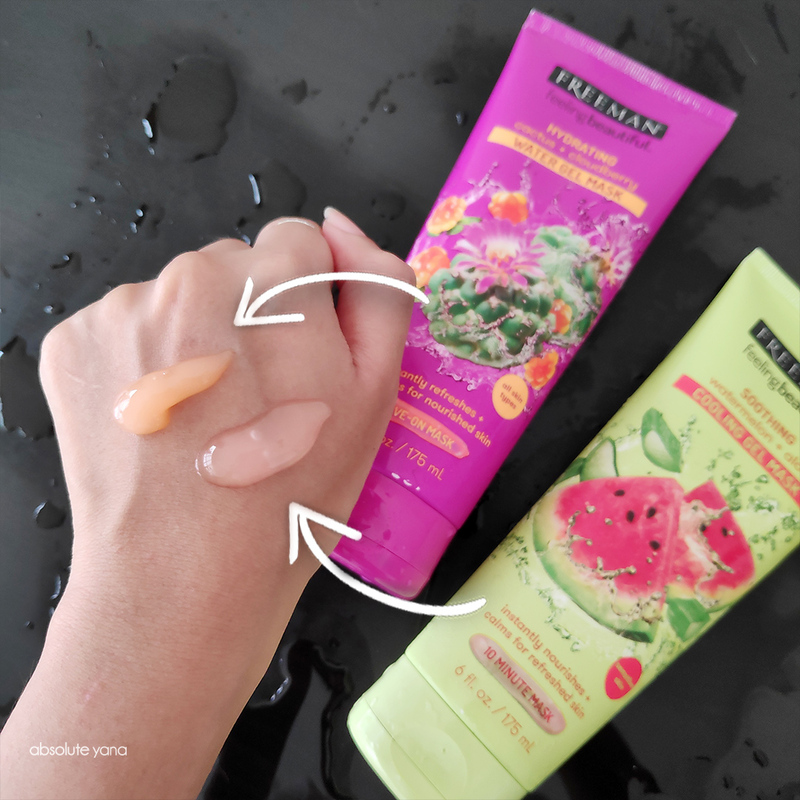 I actually prefer using the Freeman Hydrating Cactus + Cloudberry Water Gel Mask as it smells really fruity (almost jell-o like) and it really helps to restore the moisture back into my skin. Plus its a leave-on type, which lessens the hassle of me having to wash off the product. 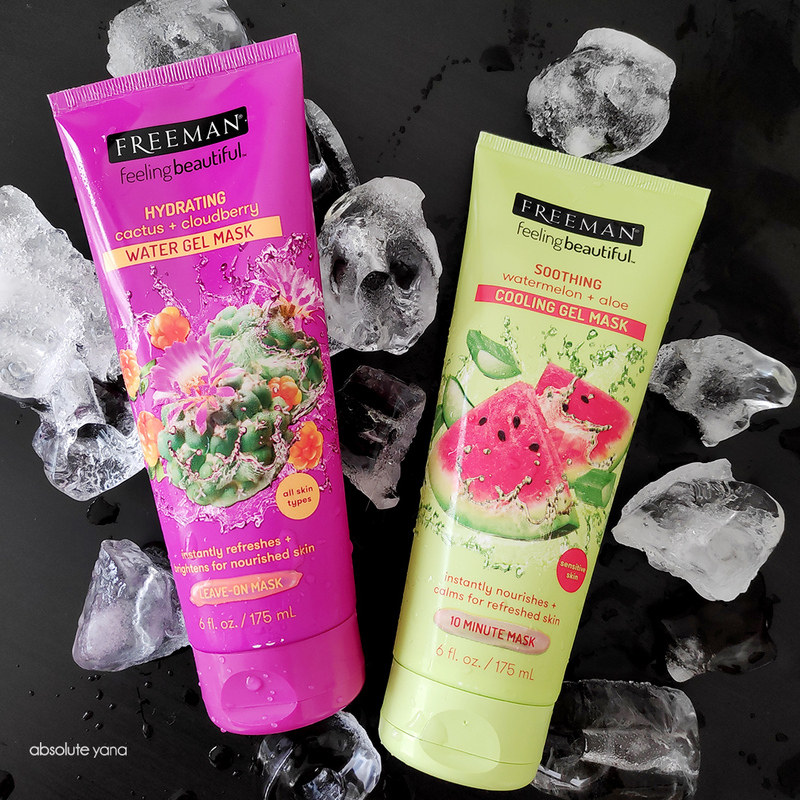 If you like watermelon salad then you would fall in love with the Freeman Soothing Watermelon + Aloe Cooling Gel Mask, because that's exactly how it smells like. Very refreshing indeed. Both masks does help hydrate my skin but ultimately, I do love how my skin relaxes right after wearing the mask, be it leave-on or the 10-minute mask. I would highly recommend for you (both girl and guy) to get hold of any one of the Freeman Masks from any Watsons outlet and beat the heat before it gets the best of you. 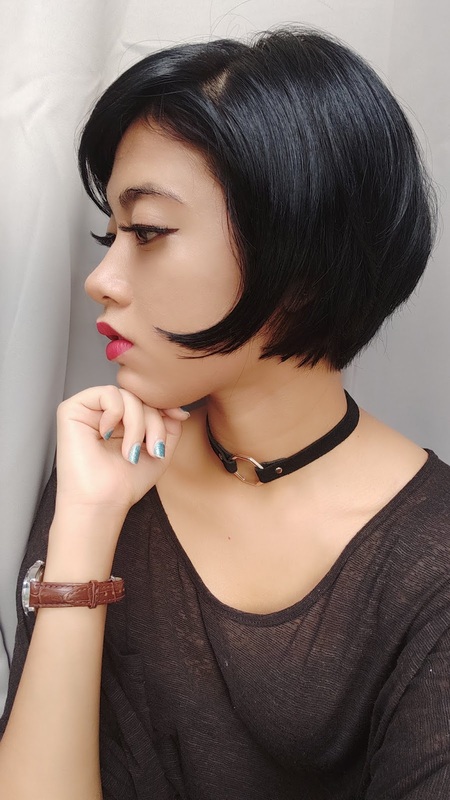 I'm not sure whether it was the build up of stress or the intense heat that Malaysians are suffering from now or it was just a spur of the moment decision to cut my hair short; but I definitely am loving my new short hairstyle. 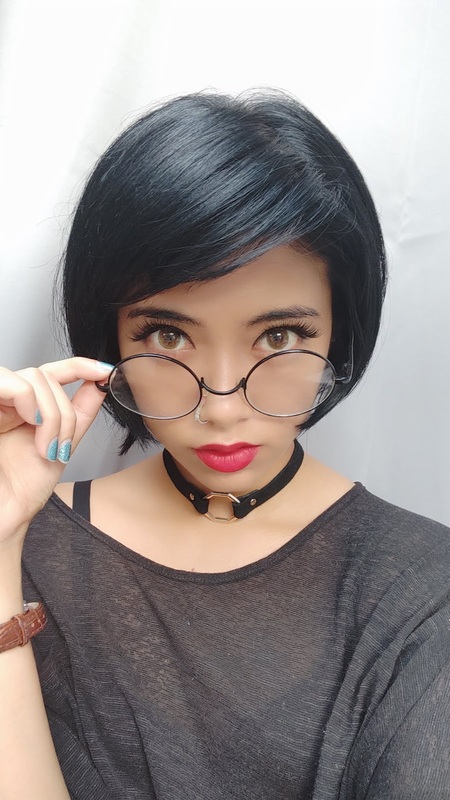 Actually, two months back I had already cut my hair short a day after my partner showed me a picture of Japanese model, Hikari Mori rocking her bold short hairstyle. 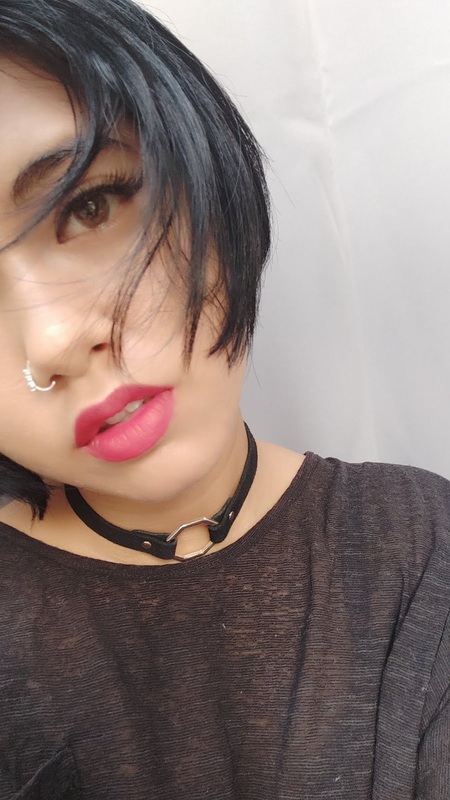 Even though I did not follow her hairstyle exactly, I just felt like I could change up my look by cutting my hair. Then came 3 days back, when I just had the 'determination' in me to actually trim my hair even more shorter; hence the look that I have now. 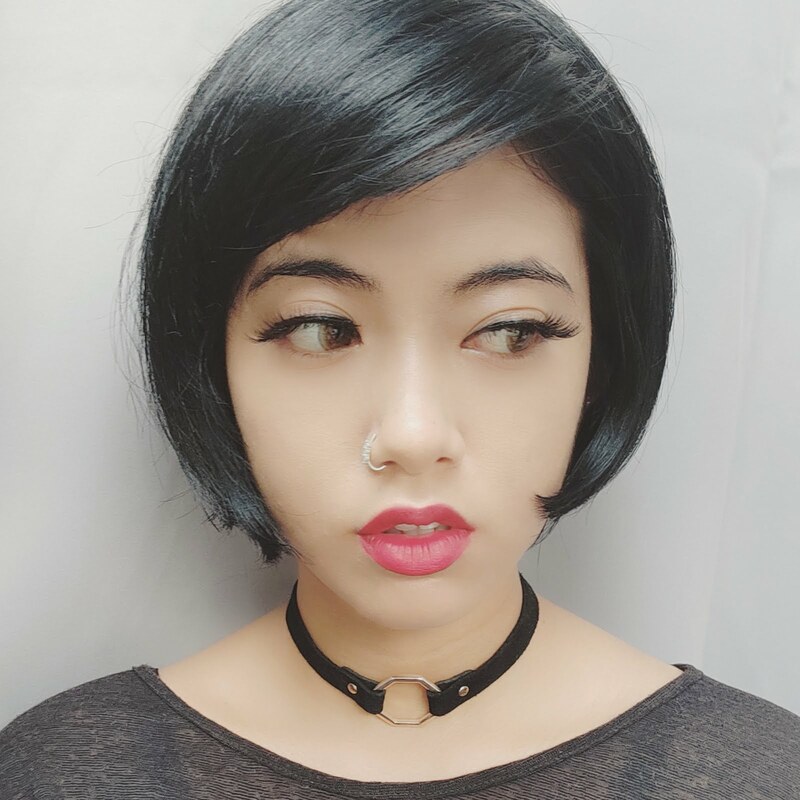 In comparison to the previous hairstyle, I am actually loving this short hairstyle even more. 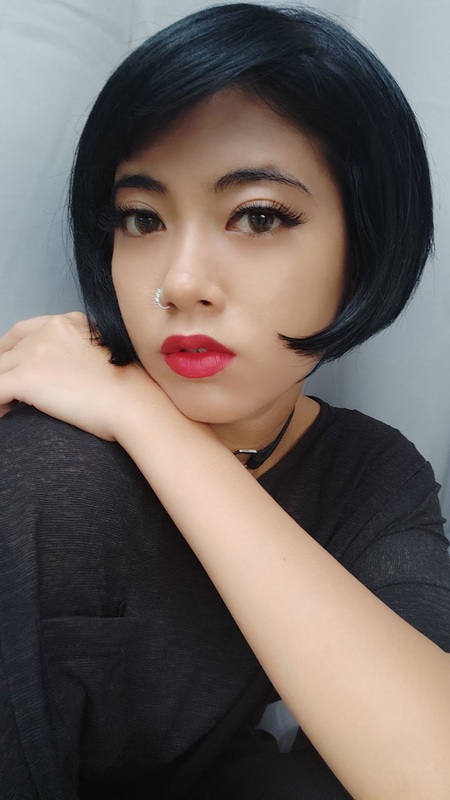 The only thing that is bugging me is the part where I got my fringe chopped, and the person did it too short, so much so that I have to spray my hair to the side nowadays or sometimes I'd follow the fashion trend by clipping on several hair clips to secure my fringe to the side. Besides the fringe, I am really digging the new look. Are you liking my new look too? I can just laugh out loud at these people. Just because you think I look beautiful with long hair doesn't make me feel beautiful about myself. And only by doing the things that I want to do, makes me feel beautiful and empowering. 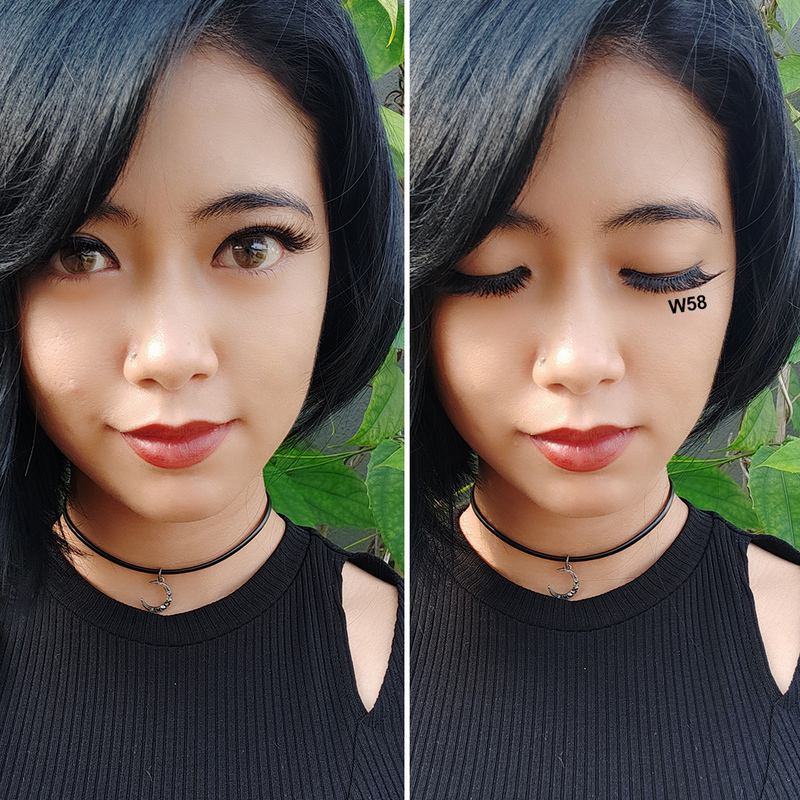 Anyways, a day after I re-styled my hair, I got to be vain and spent a good 10 minutes in front of my phone camera and snapped all these pictures. Just sharing, because I felt it will be a waste if I didn't. Let me know what do you think about this new look. You can drop all your honest opinions below at the comment section. 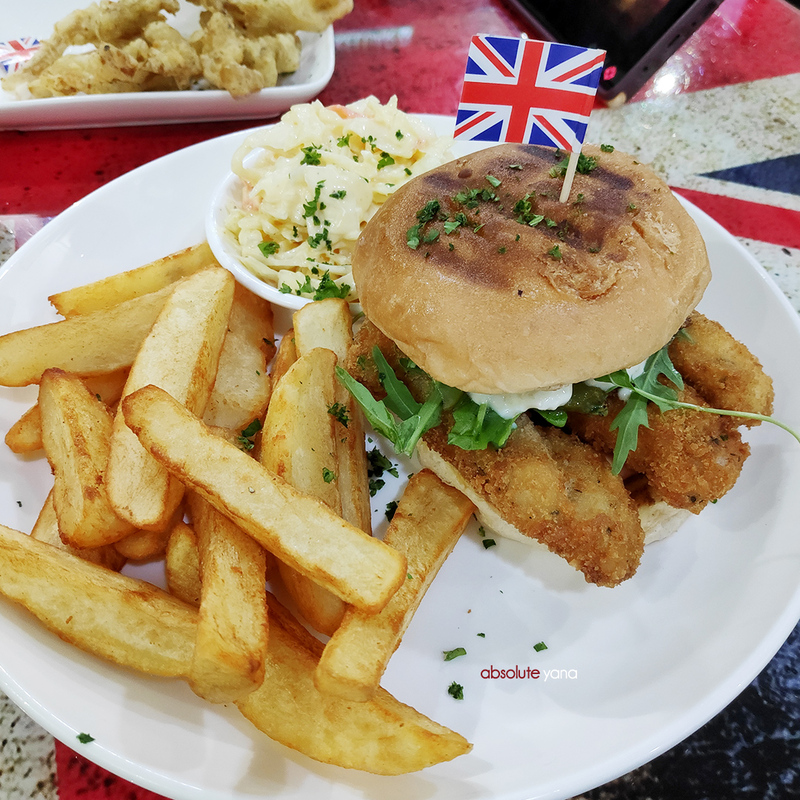 I went for my second round of Cor Blimey, unfortunately, I still couldn't get to taste the Seafood Pie, but I did get to try their Fish Fingers Gourmet Burger. And I can finally properly fall in love with batter-fried food! Crunchy and yummy are the only words needed to describe my meal. Oh! 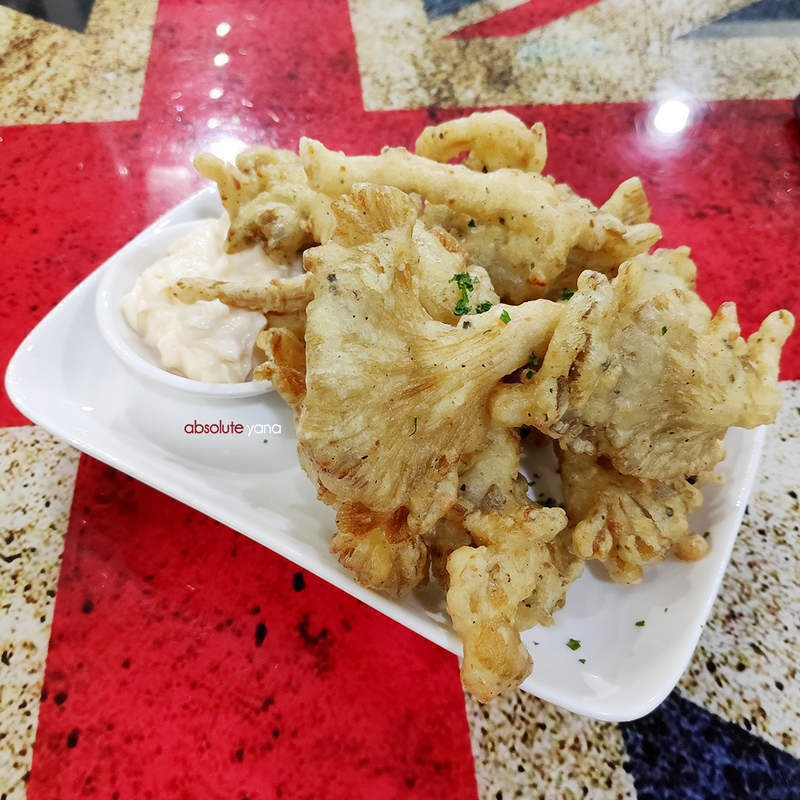 And my partner and I, we also had Fried Mushrooms; dare I say that that was the best fried oyster mushrooms that I have had so far. As promised, I took a picture of their menu this time, just so that you can have a glimpse of their pricing and what other dishes do they have. I am determined to try their Seafood Pie the next round, hopefully third time is the charm. If you'd like to know what I had previously, don't be shy to scroll down for more info. Till the next meal at Cor Blimey...let's sail away! 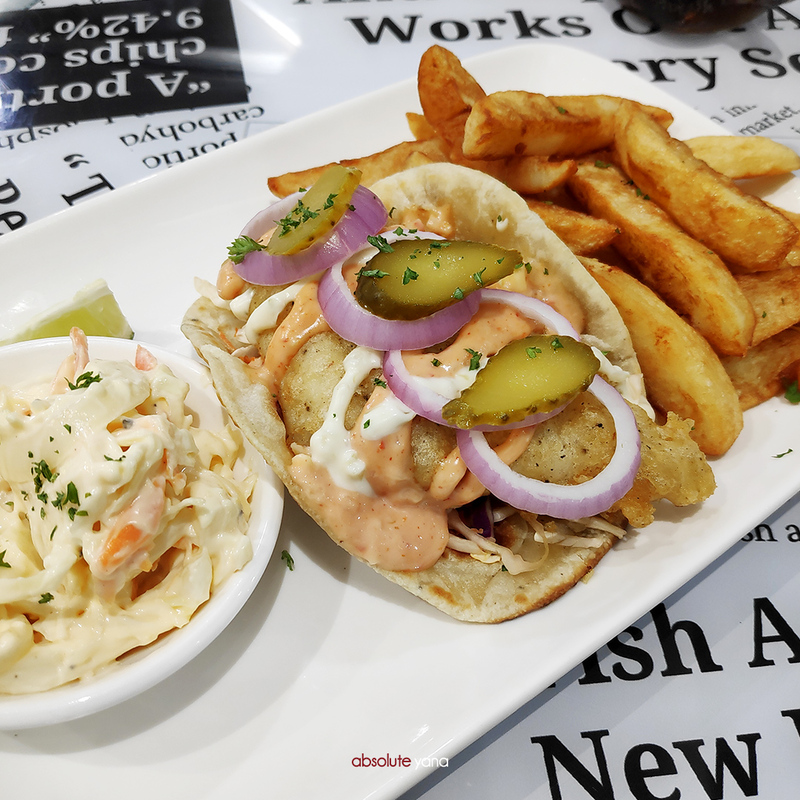 Are you a fish and chips lover? 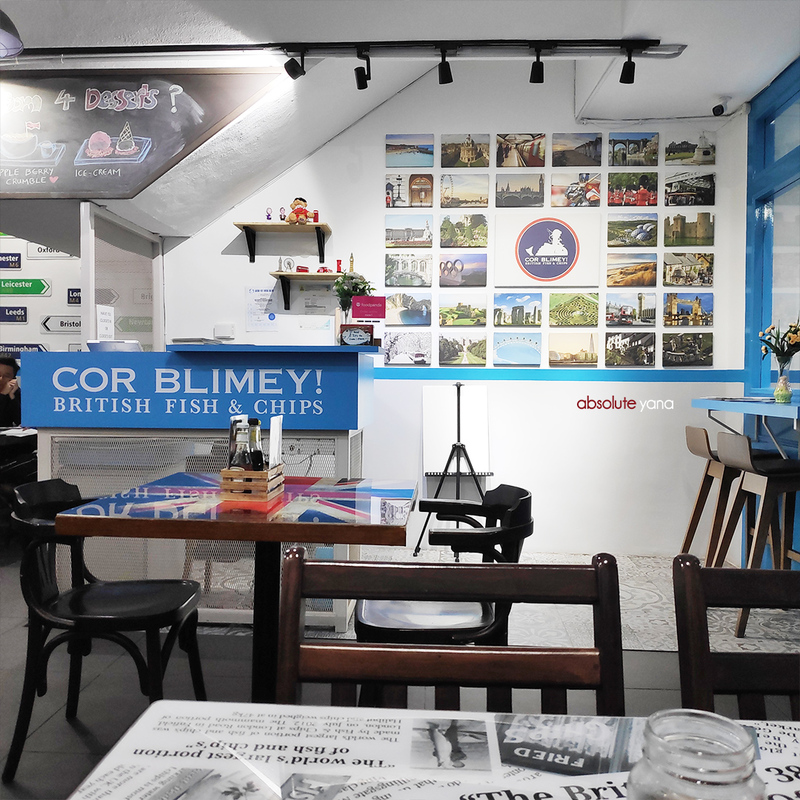 If you are, then you should go to Cor Blimey British Fish & Chips at Damansara Uptown. Last week, my partner brought me to this restaurant as he is one major fish & chips lover. Me, on the other hand, am a very Asian kind of person, that prefers fish meals which are prepared fried or steamed with Asian spices. Never been a fan of deep fried meats, doesn't matter if it is fish or chicken. 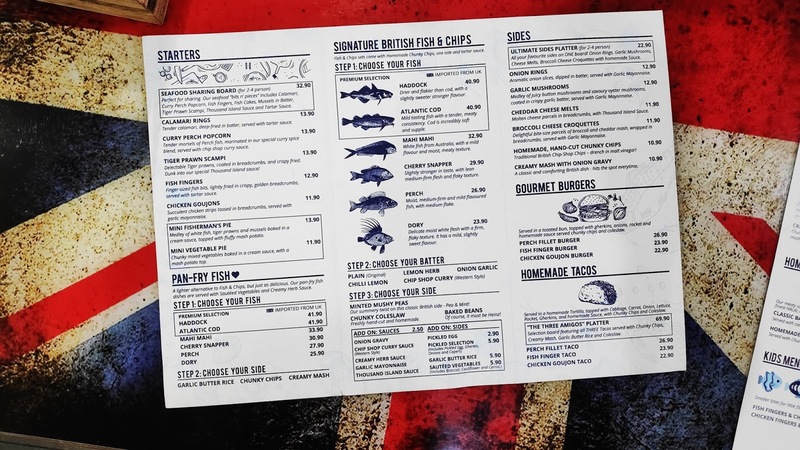 Despite unable to properly enjoy and appreciate Cor Blimey's fish and chips, I will truly recommend this Cor Blimey outlet because their staffs are really top notch friendly and accommodating! 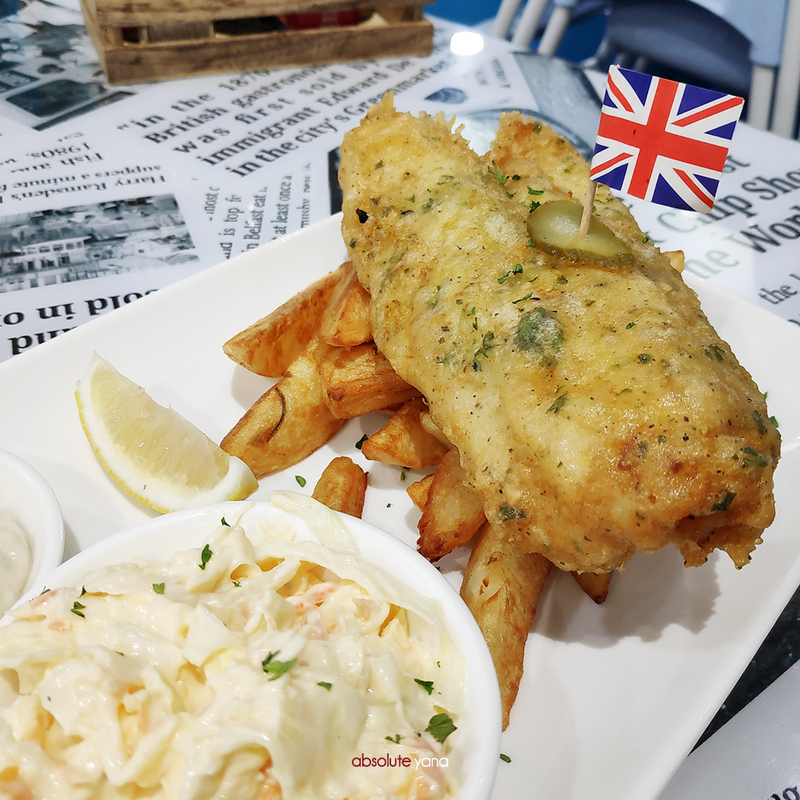 No doubt that the food is yummy, I just don't know how to appreciate fish and chips in general [since Malaysia is lacking outlets which serve good fish and chips] but I do know when to give good food when credits are due. And this one definitely deserves highest recommendations. I really wanted to try their Mash Potato series, however, due to high demand, they always run out of stock by day end. So it is best to pre-order or arrive at their doorstep the moment they open the shop. My partner and I are aiming for another round, this time arriving much earlier to try their Mash Potato meal. The last round, I got to try their Taco Fish Fillet (forgot what was the dish's name). I think this can be my kind of fish and chips as it has more texture to the meal. The Taco bread and pickles made it easier for me to enjoy the whole meal. The portion was quite filling, I couldn't finish my french fries, at the end. My partner enjoyed his classic Fish and Chips which was also served with a bowl of Coleslaw. He even drizzled a good amount of vinegar on his meal. 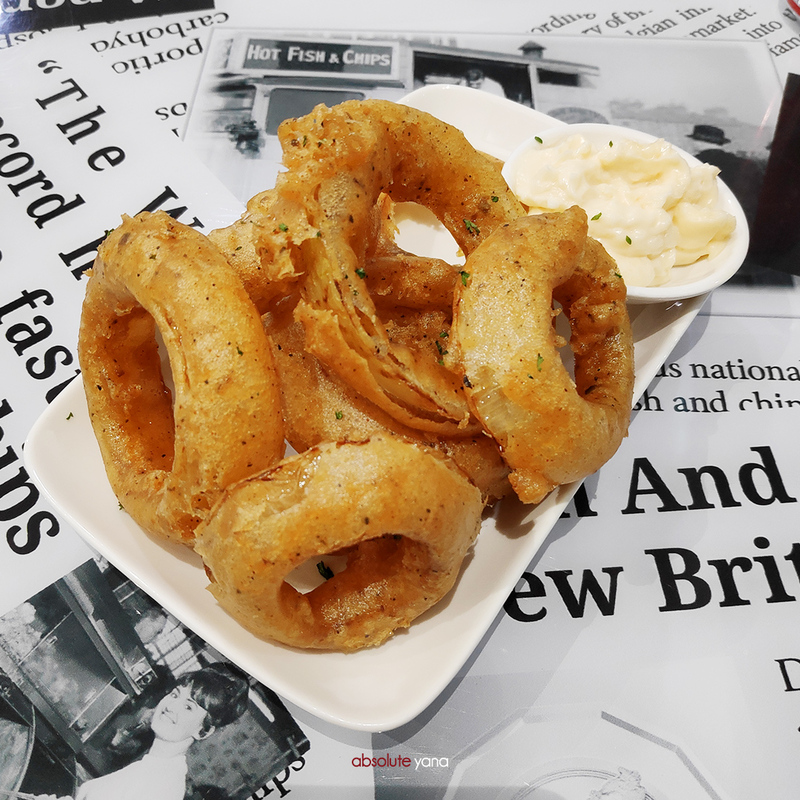 On top of our separate dishes, we also ordered the Onion Rings, which was quite nice. 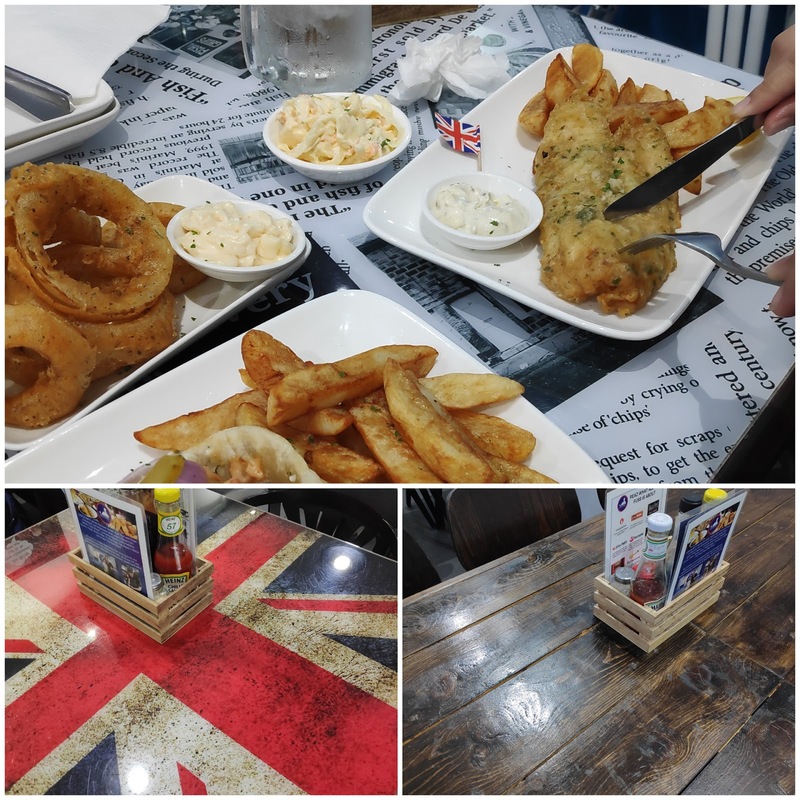 Another thing that caught my attention about the place is that they have 3 different table designs; British newspaper collage, the United Kingdom flag and also a rustic wood table design. I must say that I thought of it as a very cool and true approach to their brand. During my next visit, I will take note of their operation hours and update this post by then. 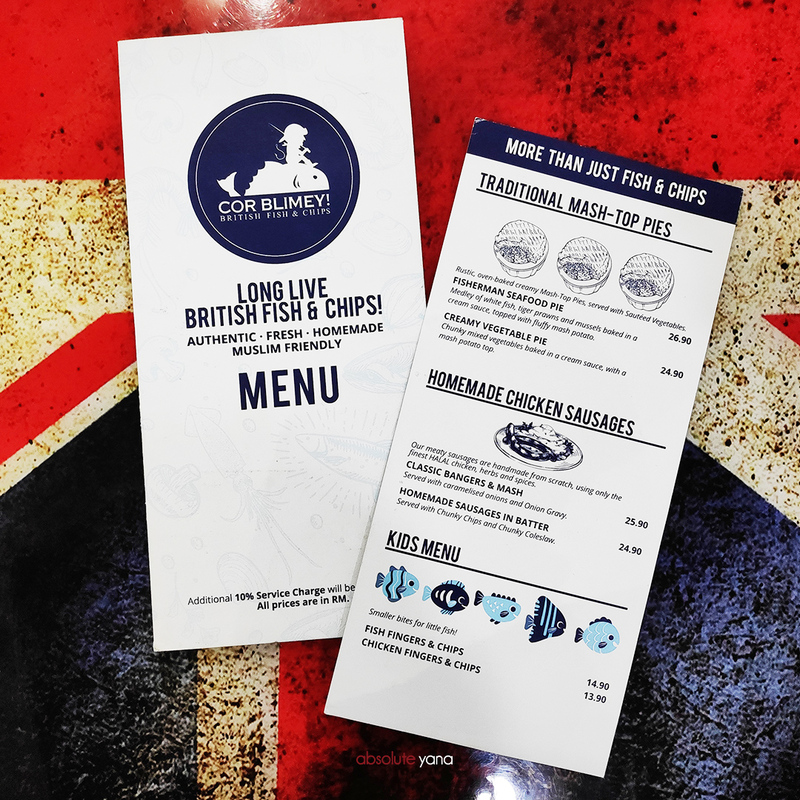 Till the next update, please do go ahead and try Cor Blimey's British Fish & Chips.